Inquiring about salary and benefits early in the interview process is a cardinal mistake for a job seeker. It is one of the primary reasons prospective jobs are lost prematurely. It sends a negative signal to the employer that you are more interested in yourself than in the company and focuses attention away from your capabilities and accomplishments, where the spotlight belongs. We usually advise job seekers to say nothing about money, if possible, until after the employer makes a job offer. The subject of salary and benefits will obviously come up at some time during the interview process. Once the company decides it likes you and wants to make an offer, it certainly will tend to be higher than if you insist on knowing about compensation before the company realizes how good you are. One of the surest ways to sabotage your chances is to start discussing your monetary needs before the potential employer has a chance to get acquainted with you. It becomes understandable when you use the time-tested salesman’s technique of putting yourself in the customer’s (in this case, the prospective employer’s) shoes. The employer has a job opening but has not yet decided who will be hired. At the outset, your chances are as good as those of anyone else. How you handle yourself in the first job interview will determine whether you are invited back for successive interviews. There are usually several candidates for the job, all of whom appear to be approximately equal in terms of their background and experience. The primary question becomes, why should the employer hire you over your competitors? How are you different or better? It is the unspoken question and the central question of all job interviews. The employer is concerned about the job and who may be able to do it best. Anyone whose primary concern is not the job or the company’s requirements is not showing the employer what he or she wants to be shown. At this juncture, while the employer is trying to evaluate your capabilities and decide how good an employee you would be, bringing up the subject of money is akin to dropping a bomb. The interview may have gone well up to that point with a gradual building of rapport between yourself and the interviewer. But at one stroke, you have obliterated any advantage you may have had and immediately removed yourself from consideration for the job in the eyes of most employers. Whatever discussion may ensue from that point on, the interview in effect is over because you have shown that your primary concern is yourself. For example, a manager in the manufacturing industry was concerned that he would not be able to obtain at least the same salary he was making in his previous job. He decided the best way to approach this problem would be to be up front about his financial concerns early on in the interview. He figured that if he was not satisfied with the salary the prospective employer quoted him, he would not waste the prospective employer’s time or his own by carrying the interview on any further. During his first interview, things seemed to be progressing well. He felt as though a rapport was developing with the interviewer, which was all the more reason to bring up the issue of salary. The interviewer had just asked him a question regarding a particular aspect of the business and was waiting for a response. 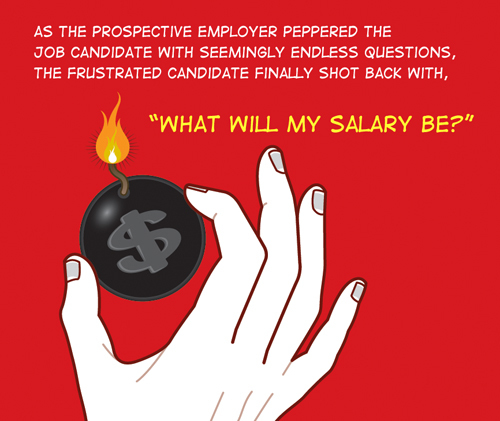 The job candidate told him that before he answered his question, he wanted to talk about salary. He named a figure and told the interviewer that he could not accept any less than that amount. As soon as the last word was out of his mouth, he sensed that he had said the wrong thing. No employer wants to be given an ultimatum. Some interviewers may take the initiative in raising the subject of money just to see how you will react. A question may be asked such as, “What would it take to get you here?” or, “We probably would not be able to afford you.” What the interviewer is trying to do is test your reaction and gauge your degree of self-interest versus your interest in the job under discussion. Knowing the reasons for the questions will enable you to avoid being trapped into an unwise answer. The best response is to defer the question, if possible, in favor of learning more about the requirements of the job. If you are pressed to name a figure, you must respond. You cannot refuse to answer a question that is asked, within legal boundaries. Just state your salary on your previous job, and let the employer decide what to do next. Tell the prospective employer what you have accomplished for previous employers by increasing their profitability, visibility or recognition in the marketplace. When you present yourself in that manner instead of voicing immediate concerns about money, you will make a favorable impression on the employer. From that point on, the subject of money should materialize with a minimum of pushing on your part as you return for successive interviews. When you do get around to the subject of money and the interviewer asks you directly to name a figure, be careful how you answer. Your response can be a make-or-break point in the interview. If you name a figure that is too low, you will come across as not being equipped to handle the job. If you name a figure that is too high, you may price yourself out of the job. Again, the best response is to state your salary on your previous job and await the employer’s next move. Most of this is wise advice, but I disagree on some of the points. The most important lesson I learned from “Manager Tools” is to answer any direct question by a recruiter with a direct answer. You can always add fluff later in your answer. Certainly never avoid an answer. Since questions on pay are normal in interviews, come prepared. You should have thought about an answer to “what do you expect as compensation” before you walk through the door. There are a few points I believe are outdated. Employers in the modern business world understand that employment is a two-way street – essentially it’s a business trade between two parties. While it may not be a good idea to discuss salary upfront, I would be wary of any employer who uses tricks to get a “reaction” from a candidate. It’s not professional or respectful – would you want to work in such a place? DO NOT mention your salary at your previous job!! Your compensation should be based on the value of the services you provide to the prospective employer, not on what you made with a previous employer! Research average salaries for the position you apply (not your current position) and guage the strength of demand of supply with the employer (do they especially want you, or are they indifferent, what qualities do they value and would be willing to pay more for?) A good response is to quote an average market salary, then explain why you deserve more, or would be wililng to take less.